Obesity. 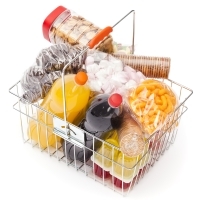 Foods that are high in sugar are often calorie dense and nutrient poor. Therefore, eating too many of them can easily lead to weight gain. Several studies have recognized connections between excess consumption of sugar and obesity. For example, the Nurses’ Health Study II found that weight gain over a four-year period was highest among women who increased their sugar-sweetened soda consumption from one or fewer drinks per week to one or more drinks per day and was smallest among women who decreased their intake. Diabetes. Similar studies have also found that excess sugar consumption leads to an increased risk for diabetes. The Nurses’ Health Study found that women consuming one or more sugar-sweetened sodas per day had an 83 percent increased risk for type 2 diabetes compared with those who consumed less than one of these beverages per month. Nutritional deficiency. When you consume too much sugar, you “crowd out” other foods that provide important nutrients, such as fruits and vegetables. This can be especially bad for children and teenagers who need nutrients for growth. For example, if a child chooses soda over milk she is missing out on vitamin D and calcium, both of which are essential for bone health. Unfortunately, people who are trying to make healthier choices by choosing fat-free and low-fat products are often trading a reduction in fat for an increase in sugar – which is added to make up for lost flavor. Make sure you check the label to see how much sugar, as well as fat, is in a low-fat product.